"Think about it. This thing on its hind legs could walk up to the average single-story house and could look on the roof at eye level." There was never a question that the brown bear that 22-year-old airman Ted Winnen shot to death in October 2001 on Hinchinbrook Island was huge. One photo shows Winnen holding the bear's paw as it obscures almost all of his chest. A second photo shows Winnen crouched looking like a child behind the bear's massive, bloody head. But the "legend" e-mail, as Forest Service spokesman Ray Massey calls the tale that's been making the Internet rounds all this time, has converted the bear into a monster of impossible proportions. It's now "over one thousand six hundred pounds . . . 12'6" high at the shoulder," reads one message Massey has received. E-mail exaggerations about the animal began to circulate little more than a month after Winnen, stationed at the time at Eielson Air Force Base, shot it while deer hunting with several partners. Some of the early e-mails reached the Anchorage Daily News, and the paper published a story about the kill in December 2001 accompanied by the two photos taken by one of Winnen's partners, Eielson Staff Sgt. Jim Urban. Despite the newspaper story, the e-mails did not stop. Nor did calls to the agency from print and TV reporters wanting to know if the e-mail version was true. "I've gotten calls from media all over the world," Massey said one day last week. "I got a call from London today." The Forest Service, which manages the Chugach National Forest encompassing Prince William Sound, gets three or four e-mails about the bear every week that have to be answered, Massey said. Many of the messages are from people who are skeptical and want confirmation of their doubts from the agency. About 30 percent of the messages come from hunters who are all but certain the tale is a tall one. What's got Massey somewhat concerned, however, is that the circumstances of the bear's death morphed some time ago into what he terms an urban myth -- about a killer beast taken down by a Forest Service employee. "He was out deer hunting when a large world class Griz charged him from about 50 yards away," according to one e-mail tale that has been circulating. "The guy unloaded a 7mm Mag Semi-auto into the bear and it dropped a few feet from him. This thing was still alive, so he reloaded and capped it in the head. ... It's a world record. 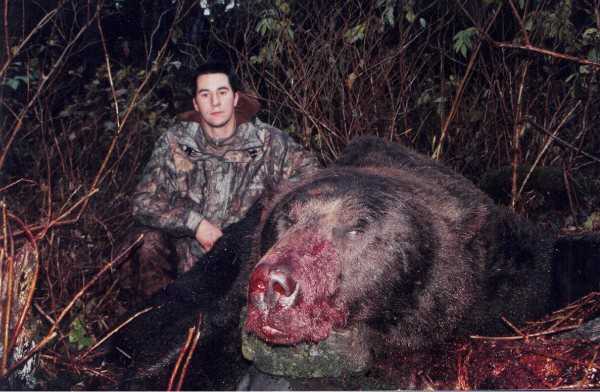 This bear had killed a couple of other people." The bear was not a record, and it didn't kill anyone, as far as is known. It was coming toward Winnen and Urban from about 10 yards away, but it may not have seen them. And Winnen used a .338-caliber Winchester Magnum. Hoping to debunk the myths, Massey answers the e-mails with plenty of details about the actual size of the bear and the hunt. The Forest Service's Web site provides a news release about the hunt and the rumors. But now a third photo is making the rounds, a picture that supposedly shows a person's body, the bear's victim. Massey never opened that attachment, he said. "I didn't want to see a photo of the body. I know it's bogus." Massey says there's no way to know how many people are reading the false stuff as the message travels the globe. He just scratches his head and says that, 19 months after the hunt, the story is still going. "It's like the Energizer bunny," he said. "I have no doubt the Internet is keeping it moving. Otherwise it would have died a long time ago." It was a big bear -- its front legs spanning 11 feet from claw tip to claw tip, its skull the size of a beer keg, its paws as big as a man's chest. 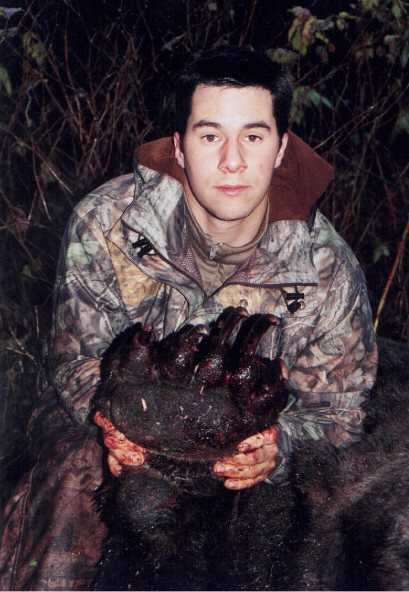 An Eielson Air Force Base airman shot the record-book grizzly during an October 2001 deer hunt in Prince William Sound. But perhaps equally amazing is how much the bear has grown in size and legend in just a few weeks' time on the Internet. Hundreds of people around Alaska and across the country are circulating photographs of the bear and the hunter who shot it. With each missive, the tale and the bear seem to grow. By the time e-mail stories started reaching the Daily News in late November, the bear towered 12 feet, 6 inches tall and weighed more than 1,600 pounds. Another writer said the ferocious bear had charged the unsuspecting deer hunter, who emptied his gun, but shot the bear dead in the nick of time with his last shell. Though this was indeed a big bear, those numbers and that sequence of events aren't right. So how big was the bear, and what really happened? Here's the story as told by the hunter, Theodore Winnen, a 22-year-old crew member of the 18th Fighter Squadron at Eielson Air Force Base near Fairbanks. Winnen wasn't there to hunt bear. Instead, he and his hunting buddies packed for a week of hunting for Sitka blacktail deer on the remote, wooded island. Winnen did, however, pick up a permit to shoot a bear just in case. On day two of the group's hunt, the skies cleared at 8:30 a.m. Winnen and Eielson Staff Sgt. Jim Urban set out to follow a creek bed upstream looking for deer. Urban was carrying a .300-caliber Winchester Magnum. Winnen was carrying his significantly more powerful .338-caliber Winchester Magnum in case a bear crossed their path. ''He's a shooter,'' Urban said under his breath. ''I said, 'When the bear crawls over that log, he will present his vital areas and we'll take him,' '' Winnen recalled. ''I brought the rifle up to take a shot, but the bear moved over the log like it wasn't there. ''I put the scope on him. I wanted to hit him in the chest, but all I seen was nothing but head. ''My partner said, 'Shoot! Shoot!' '' Winnen said. ''I aimed for his left eye, but the bullet takes an arc and I hit about two inches low in the side of his muzzle and into his brain. ''He buckled backwards and raised his head like he was going to howl at the moon, but nothing came out,'' Winnen said. ''I put two more rounds in the vital area, then three more after that. Six total." ''It was amazing when I got close to him,'' Winnen said. The two hunters spent a fair amount of time getting photos of the bruin. One photo shows his statement is no exaggeration. The paw is almost as wide as the hunter's chest and sports 3- to 4-inch-long claws. Master guide Want said he was impressed with Winnen's story. After the kill, Winnen and Urban spent six hours skinning the bear -- and trying to drag its hide and skull back to the Forest Service cabin they had rented. The meat was left behind because grizzly meat is generally considered inedible. Winnen guesses the bear's hide weighed more than 200 pounds. They took turns carrying it, but eventually put it on a tarp and tried dragging it together. When they were within a half-mile of the cabin, they summoned their hunting partners, Eielson Staff Specs. Ron Lutrell and Jim Scheu, a flight chief based at Elmendorf Air Force Base in Anchorage. Winnen spent the next three days at the cabin working with his knife to scrape fat from the hide. He packed the hide with salt for the return trip to Fairbanks. Once back, Winnen took the hide and skull to the state Department of Fish and Game to get it sealed, as required by law. Unofficially, Fish and Game records show, the skull scored 28 and 8/16 inches. Skulls are scored for size by combining the width plus the length. The skull of Winnen's bear was 10 11/16 inches wide and 17 13/16 inches long. This is called a green score, which is the unofficial score until the skull dries and can be remeasured. The Boone and Crockett Club, which uses a 16th-of-an-inch measurement system to keep records on the biggest animals shot in the world, requires that bear skulls dry for 60 days before an official measurement is made. A tooth was pulled from the jaw of the skull by a state biologist so the bear can be aged. Biologist Crowley said he suspects the bear was 15 to 20 years old. He added that the bear was no stranger to guides who know the area. Bears are hard to hunt on the brushy and heavily wooded island, Crowley said, because the season doesn't open until Oct. 15, after the salmon run is over. The bears have largely dispersed from salmon streams by then, making them harder to find. The hide measures 10 feet, 6 inches from nose to tail. While it is impossible to know exactly how much the bear weighed, master guide Want has measured and weighed dozens of Kodiak brown bears over the years. Based on the measurements and information he got from Winnen, he suspects the bear weighed between 1,000 and 1,200 pounds. By any standards, that's a world-class brown bear. All brown bears taken with skulls that score over 28 inches are eligible for listing with Boone and Crockett, the official record keeper for North American trophy hunters. In Alaska, the biggest brown bears are found on Kodiak Island and the Alaska Peninsula. The record Alaska brown bear -- killed on Kodiak Island in 1952 -- had a skull that scored 30 12/16. Only 19 bears have been shot with skulls that scored over 30 inches since the early 1900s, according to Boone and Crockett. The fact that Winnen's bear came from Prince William Sound makes it even more remarkable, Want added. Between 1970 to 1999, about 600 male brown bears were killed in Prince William Sound, according to state Fish and Game records. Of those, only two had skulls that scored more than 28 inches, Want said. The vast majority had skulls that scored 22 to 23 inches. Bears with heads that size typically weigh 350 to 400 pounds, Want added. Winnen is having the skull preserved and mounted on a plaque. The hide is with a taxidermist, being made into a rug. ''With the small rooms in base housing, it'll be more like wall-to-wall carpeting,'' Winnen said. Meanwhile, the e-mails keep circulating. The genesis appears to have been a radio talk show in Fairbanks on which Winnen appeared. Photos from his hunt showed up later on the radio show's Web site. And that appears to have been what got the Internet humming. with 3- to 4-inch claws.